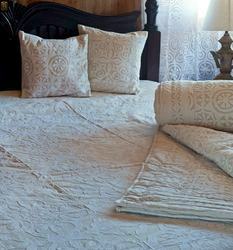 We are offering wide range of Bed Covers, which have been made through superior quality fabric. Our bed covers are highly worked upon which actually gives them a very attractive look. These bed accessories carry very smooth and soft colors which gives a very comfort look to the eyes. Vishal handicraft a name of trusted in market for the quality and design. We are the leading supplier and manufacturer of Applique Bed Covers. We are provided a unique design and color combination of applique bed covers. We are based in Jaipur. We are offering wide range of Bed Covers, which have been made through superior quality fabric. Our bed covers are highly worked upon which actually gives them a very attractive look. These bed accessories carry very smooth and soft colors which gives a very comfort look to the eyes.